With not even a full day booked in Amsterdam, I thought our visit would consist of a visit to the Anne Frank Museum, a general admire of the canals and a little bit of vague, unguided sightseeing ie. we would wander around the city for a few hours and not really know what we were looking at. Fortunately however, the super tourist powers we had acquired in London were still in full force across the channel. Within an hour of arriving at our hotel, and thanks to an armful of brochures we had procured in the lobby, we hooked up with a free three hour walking tour of the city. The tour arrangement was quite interesting. The company, Sandeman’s New Europe, work with freelance tour guides in major cities. They run free city tours and the guides are paid by tips. At the beginning of the tour the guide explains how this works, confirms that tipping is not obligatory but asks that if you have enjoyed the tour, you consider tipping at the end. David, the tour guide, suggested that the liberal attitude of Amsterdam can be summed up as follows; You can basically do whatever you like so long as 1) You’re not hurting anyone 2)It’s good for business. After a quick shower at the hotel, we joined the same guide for a paid walking tour of the Red Light District. I guess a description of this and the politics etc around the Red Light District could fill an entire blog entry or two at least. I won’t say very much on this but it was certainly worth going to see for yourself and the tour added some interesting commentary about the politics, practices and procedures of the area as such! The next day, with our super tourist knickers hitched firmly over our tights of exploration (metaphorically speaking of course), we set off to explore the rest of Amsterdam. After dropping our bags in storage at the station, we caught the tram across town to the Anne Frank Museum. The House is a very engaging display. I had read the Diaries when I was a kid but I think even without this, the Museum tells the story of Anne and her family very well. It is both an empty shell and yet very personable as the videos and items on display give an insight into the plight of Jewish people forced into hiding during Nazi occupation, through the experiences of these two families and more specifically from the point of view of one young girl. We stopped for lunch at a pancake house before jumping on a canal cruise. The commentary was interesting, the canals were beautiful but I won’t lie… I did fall asleep for about 20 minutes of the hour. This is no reflection on Amsterdam, the lull of the water was just too much for me. From here, freshly rested and on the recommendation of our invaluable tour guide, David, we trammed out to the western side of the city to check out a micro-brewery. The brewery is shaped like a windmill, which appealed to our somewhat kitschy tastes, and offers, one of our all time favourite alcoholic pastimes, a beer tasting menu. 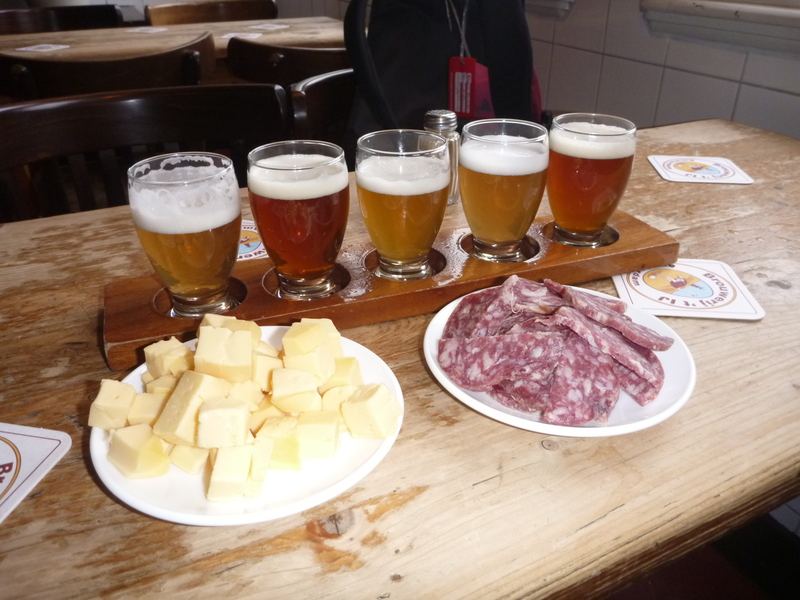 This was well worth the visit and I could quite happily have nested in there for the afternoon but five beers, one plate of cheese and a salami later, it was time to beat the rain back to the city and jump on a train to Eindhoven. The next six days were spent with Ryan’s extended family in the Netherlands. First in Eindhoven with his Mum’s cousin, Lieneke and her husband Ger, and then in Maarssen with another cousin, Greet and her husband Bert. This was incredibly nice and both sides of the family were amazingly warm and welcoming. Our time in Eindhoven was highlighted by a big family dinner, a trip to Belgium for the day, and a picturesque, if a little damp, bicycle trip around the local area. Highlights of our time in Maarssen, where we spent Christmas, included several lovely dinners most spectacular of which was cheese fondue (heaven! 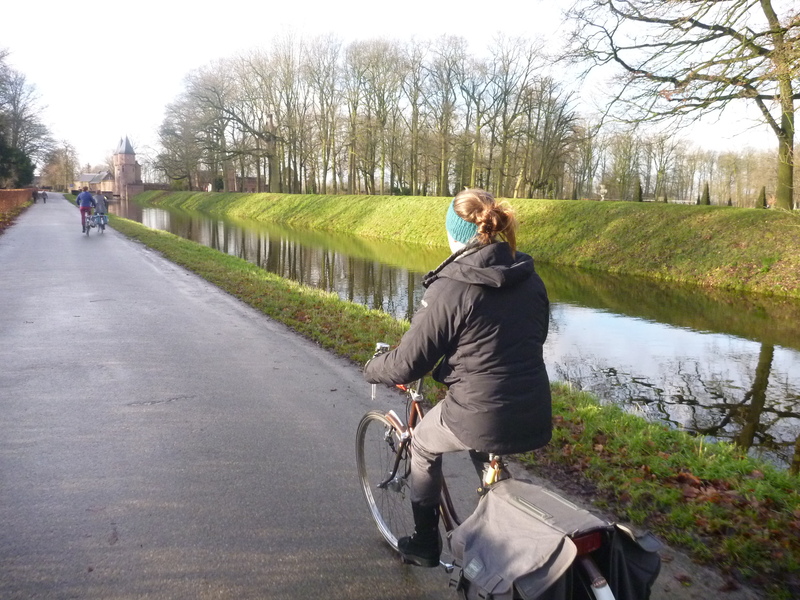 ), climbing the Dom tower in Utrecht, a trip out to the Hague, and a Christmas day bike ride out to a local castle. As far as having Christmas away goes, wintery countries certainly have the advantage for cosy Christmas markets, ice skating and the excitement of actually being able to sing Sleigh Bells in the snow, but nothing really gives me the proper Christmas feeling like a hot summer evening and the anticipation that it will be warm enough to go down to the beach for a swim. This entry was posted in Matryoshka, White Christmas and Reindeer Burgers, Travel and tagged Amsterdam, Netherlands. Bookmark the permalink.